PANORAMIC OCEAN & MOUNTAIN VIEWS. 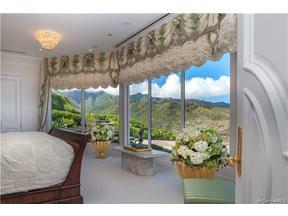 HOLLYWOOD GLAMOUR & NEW YORK ELEGANCE - ONE-OF-A-KIND LUXURY RESIDENCE IN HONOLULU, HAWAII! Designed/built by Al Masini, famous TV producer and creator of "Entertainment Tonight". 2-story hillside home offers unmatched quality in every detail. 5-star Resort atmosphere w tropical waterfalls, outdoor spa Jacuzzi, Biometric entry elevator, personal gym & 4-car garage. Hand selected exceptional stone/marble/elegant finishes of the highest standards. Facing East and South, this spectacular dream home offers security in a prestigious Gated Community.